Fall in Love with "Love Letters"
The Pulitzer Prize-nominated Drama, Love Letters, by A. R. Gurney is "an evocative epistolary account" (NY times) of two special characters. Share in their relationship from second grade through college, as they grow apart and marry others, still maintaining a relationship over the years and across the miles in the time-honored tradition of letter writing. Spanning the years 1937 - 1984, this story will resonate with those who remember the Great Depression, WWII, the Cold War Years and the crazy '60's and '70's. Gary and Mary Beth are available to bring this heart-warming performance piece to your venue for corporate parties, fundraisers, dinner theatre, Sweetest Day or any day. "This dynamic acting couple's interpretation will touch your heart, amuse you and may bring a tear to your eye. I wholeheartedly recommend this beautiful play performed by these excellent actors." (Penelope Notter, Grand Rapids Civic Theatre). Love Letters​ is a perfect event for Valentine's Day, Sweetest Day or any day! Love Letters is produced by special arrangement with Dramatists Play Service, Inc., New York. 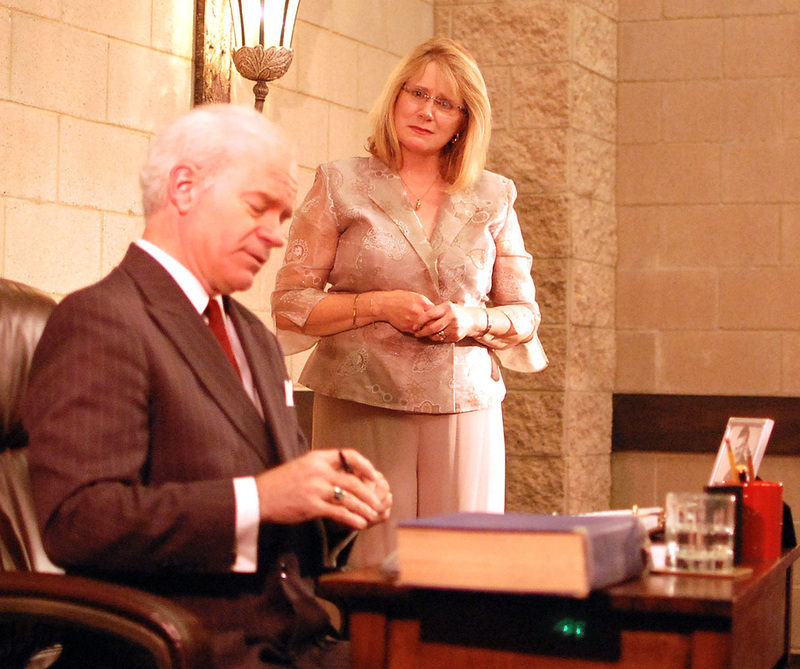 Gary E. Mitchell and Mary Beth Quillin as Andrew Makepeace Ladd III and Melissa Gardner. Photos by Terri Foley. Love Letters is $400* in the West Michigan region. For locations elsewhere in the state of Michigan or outside the state, mileage and overnight accommodations will affect the price. Please contact us. For more information, click here. *Non-profit Rate. For profit organizations add $100 for Love Letters to cover the royalty fee.